In a surprise move, Christian Dior‘s creative director, the Belgian fashion designer Raf Simons is officially leaving his three-years-long position at the French fashion House. His resignation literally caught everyone by surprise (there were neither rumors of a rift, nor whispers that he wanted to leave to rather concentrate on his own eponymous avant-garde line), as there were no signs of discontent both from Christian Dior’s headquarters (namely the LVMH group) and the designer himself. In 2011, in fact, both fans and critics were enthusiastic about Simons’ modernistic touch, which not only helped each Dior collection get a more revolutionary feminine cut, but also gave an instant opportunity for the brand to redeem itself from Galliano’s racist comments. 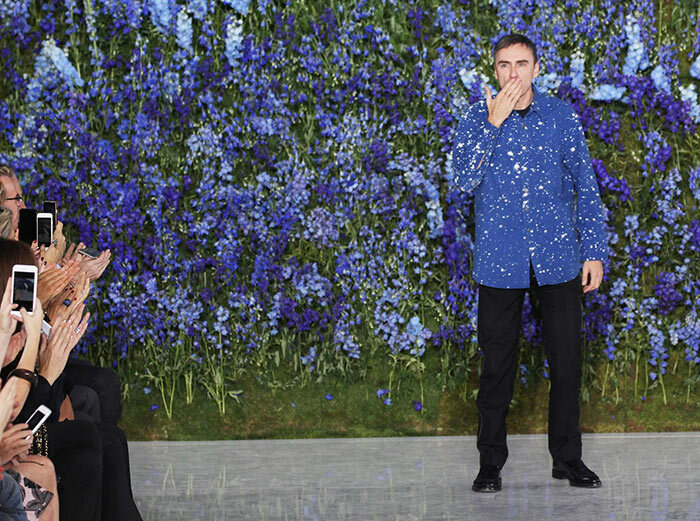 Unfortunately, there is apparently no way of turning back: Raf Simons’ resignation was confirmed in a statement by Sidney Toledano, Dior’s CEO, on Thursday 22, where he at first vaguely revealed that Simon’s decision was due to some ‘personal reasons’. Of course, as soon as Simons’ resignation had been officially confirmed, rumors about the true reasons behind his departure were already spreading. Most of the speculators stated that frustrated by Dior’s stressful demands Simons suffered from lack of time to concentrate on his own eponymous label and personal life. Of course, these speculations will never be confirmed nor retracted until an official explanation is given. Along with Toledano, the man who is probably still shocked is Bernard Arnault who, besides his professional role as LVMH’s chairman, also has a close friendship with the Belgian designer. He never missed an opportunity to praise Simons’ stylistic choices, which helped the brand fuel a 60% rise in sales since John Galliano left. Simons, who gave his (at this point) last minimalistic touch to the fashion house at the Paris Fashion Week less than a month ago, will thus be free to focus on his own label, which he has often used to explore one-of-a-kind collaborations, such as the one with Adidas. So, who is going be Dior’s new creative director? Although Dior’s headquarters could probably need some time to make a decision, many fashion critics and experts in the field are already speculating about two of the most interesting possible candidates, namely J.W. Anderson (Loewe’s current creative director), and Riccardo Tisci (the mind behind Givenchy’s collections). At this moment, however, there’s just one thing for sure: whoever is going to be appointed as Christian Dior’s next creative director has really big shoes to fill!